If this is so, then what you need is an online QR Code batch generator such as QR Batch. 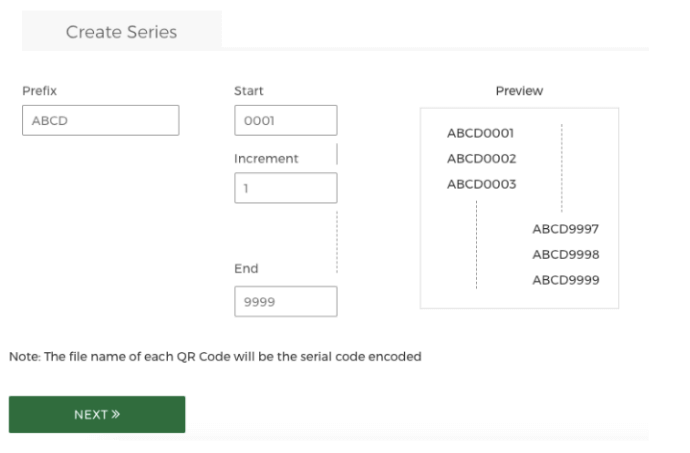 Using a QR Code Batch Generator, you can generate up to 100,000 static QR Codes—even custom-designed—in a short period of time (can vary between minutes to hours). What you get is a zip folder of all QR Code images, which you can use in your designs such as QR Code labels or business card designs. b. Text QR Code: When scanned, this QR Code displays text information such as product batch information, address, short bio, etc. 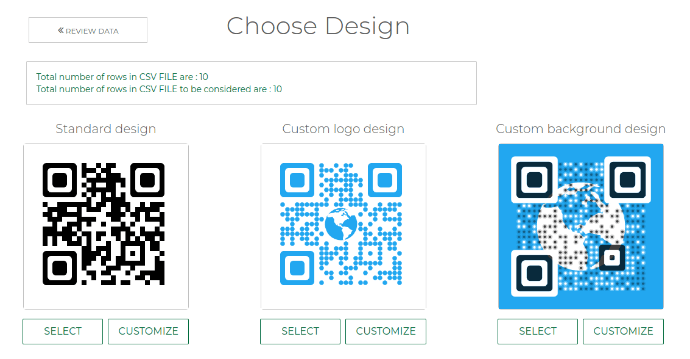 From your QR Code use case, choose which of the above QR Codes you need to create in bulk. 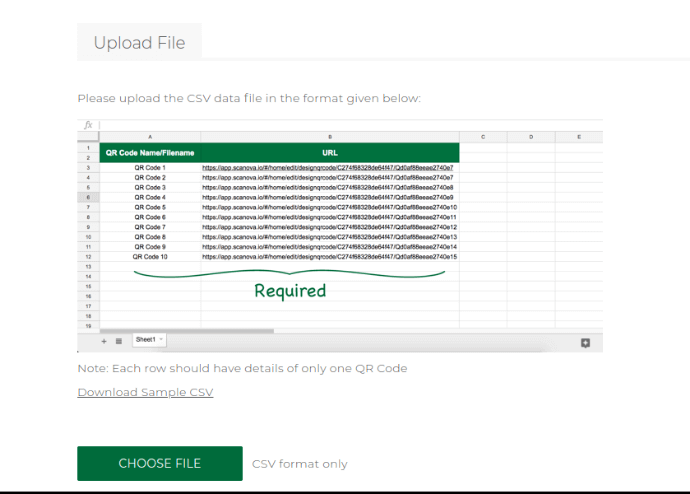 To generate the QR Codes in bulk, you will need to create a spreadsheet (XLS, XLSX, CSV). 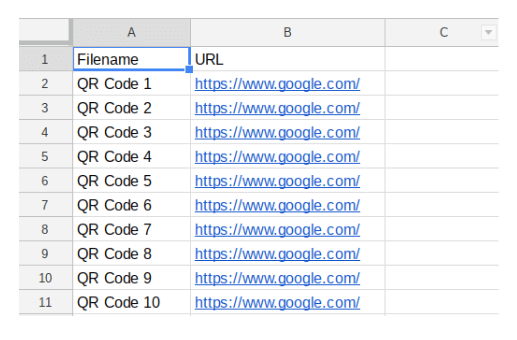 This spreadsheet will need to contain the data that will be encoded in each QR Code. One row of data for each QR Code. In general, the first column may have QR Code filename. The QR Codes images that will be generated in the zip folder will have these filenames. 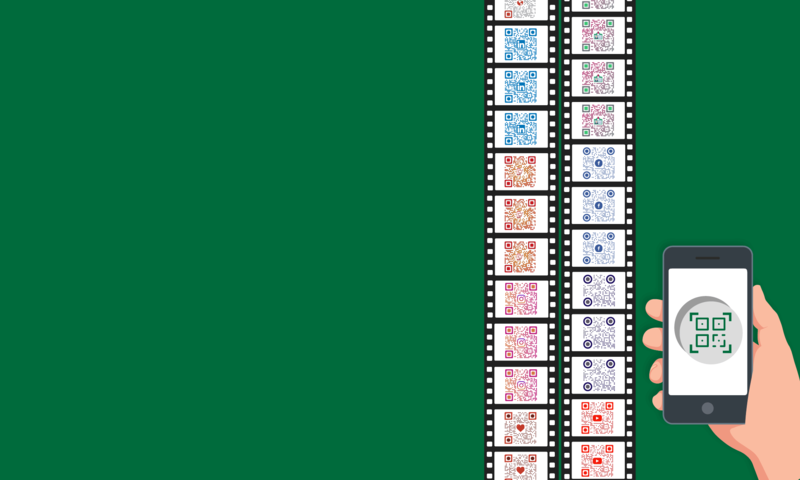 Second column onwards, there will be content that needs to be encoded in RQ Codes. 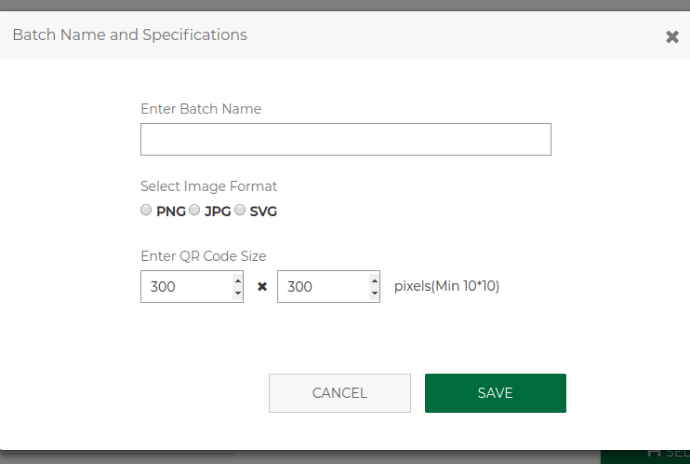 For demo purposes, we will take the example of QR Batch, an online QR Code Batch Generator. c. When you login, you will be asked to choose the QR Code category—Website URL, Text/Serial Code, or Vcard QR Code. Choose the category decided in Step 1. 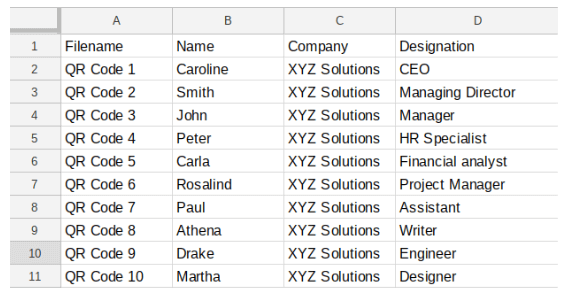 In Step 2, we had created a data spreadsheet in CSV, XLS, or XLSX format. We need to now upload the spreadsheet on the page that opens after choosing the QR Code category. If you are looking to encode serial codes in QR Codes, go to the Serial Code tab after choosing Text QR Code category. Note that in this case, you do not need to upload a spreadsheet. You can simply specify the format of the series, starting value, increment value, and ending value to generate the QR Codes. Note that the number of characters in the starting value should be equal to the number of characters in the ending value. For example, starting value cannot be 1 and ending value cannot be 999. In this case, starting value will need to be 001. 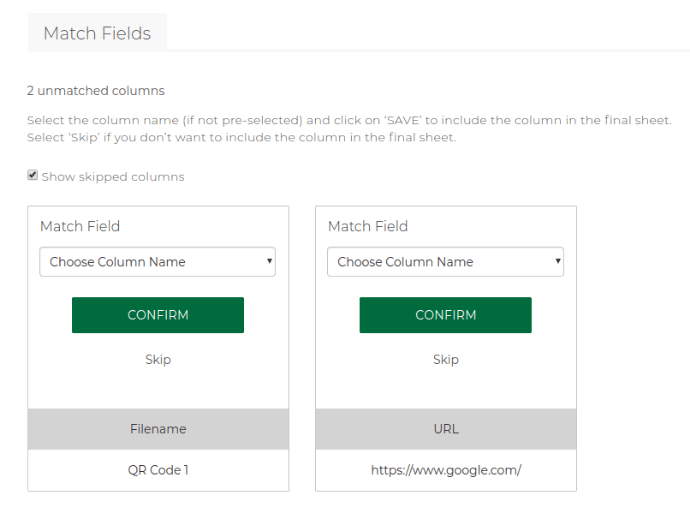 Once you have uploaded the spreadsheet, the app will prompt you to match the data in the columns with the data that will be encoded in the QR Code. For example, it will ask to confirm which column is QR Code filename, which column is Website URL, etc. If you have created the spreadsheet as per guidelines in Step 2, you should not face an issue. Simply select the field name from the drop-down list of each review box and click Confirm. Once data review is complete, proceed to the next step. In the next step, a sample QR Code will be generated (from the first row of the spreadsheet). Also, total number of QR Codes (valid rows found in spreadsheet) will also be displayed. Check if this is the number of QR Codes that you need. If this number is less, then your spreadsheet has errors and some rows were discarded. In terms of QR Code design, you will have three options to choose from—standard black-and-white, custom with logo, and custom with background. You can further customize these designs (by clicking Customize) or you can finalize the design you need (by clicking Select). If your use case is end-user facing (such as business card QR Codes) then we recommend choosing a branded QR Code. QR Codes with design tend to attract much more scans than a plain black-and white one. If your use case is more operational (such as inventory tracking), a black-and-white QR Code should work fine. When you select the design, a window will open prompting you to specify the batch name. You will also need to specify the QR Code image format—PNG, SVG. You can choose either but PNG is common if you choose the right pixel size. Also, you will need to specify the size of the QR Code image in pixels. You can use an image size converter to convert inches in pixels for a given DPI (Dots per inch) value. Use DPI value as 300 for high-resolution printing and 72 for displaying images on a screen. Once you specify these values (image format and size) and proceed in the app, the app will ask for a final confirmation. You will also be able to see a preview of one of the QR Codes. Scan this preview QR Code using a QR Code reader on your phone to test the output. If this is the QR Code you need, proceed to making the payment and generating the entire batch. The advantage of using QR Batch is that the app charges only for the QR Codes you generate. The higher the number, the cheaper is the rate. With the QR Batch price calculator, you can get an estimate of what you will be charged. The payment is made via the Paypal gateway, which allows you to pay both via paypal account or debit/credit card. Once you’ve made the payment, your QR Codes will be typically created in a few minutes. If the QR Codes are in thousands, then it can take more than an hour. Once the batch is processed, you’ll be able to download it from the Download Batch section of the app. You will also be notified via email when the batch is ready. Download and unzip the folder, and test the QR Codes again. That’s it. You can now generate any number of static QR Codes for your use case in a short period of time at an affordable rate. 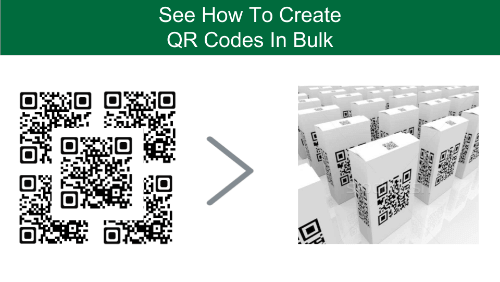 To create a QR Codes in Bulk, use QR Batch Now and generate a visually appealing batch of QR Codes.